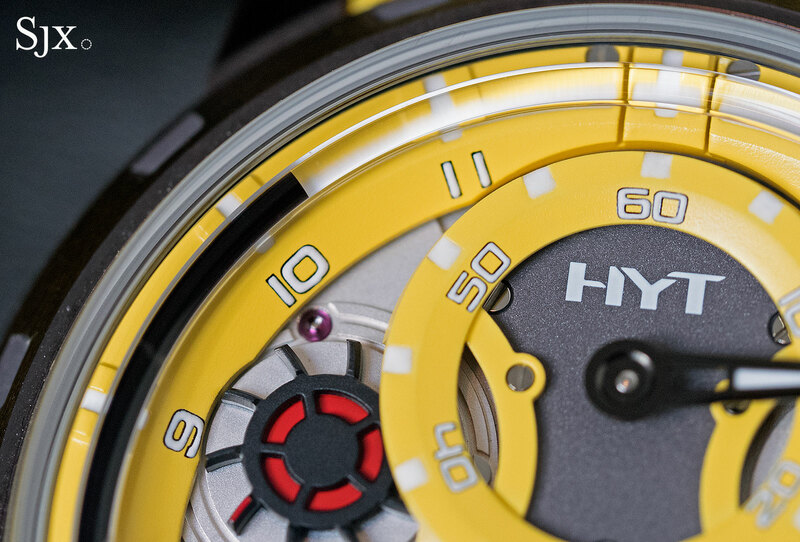 Available in three bright colours, the H1 Colorblock is a limited edition to mark HYT’s third anniversary. 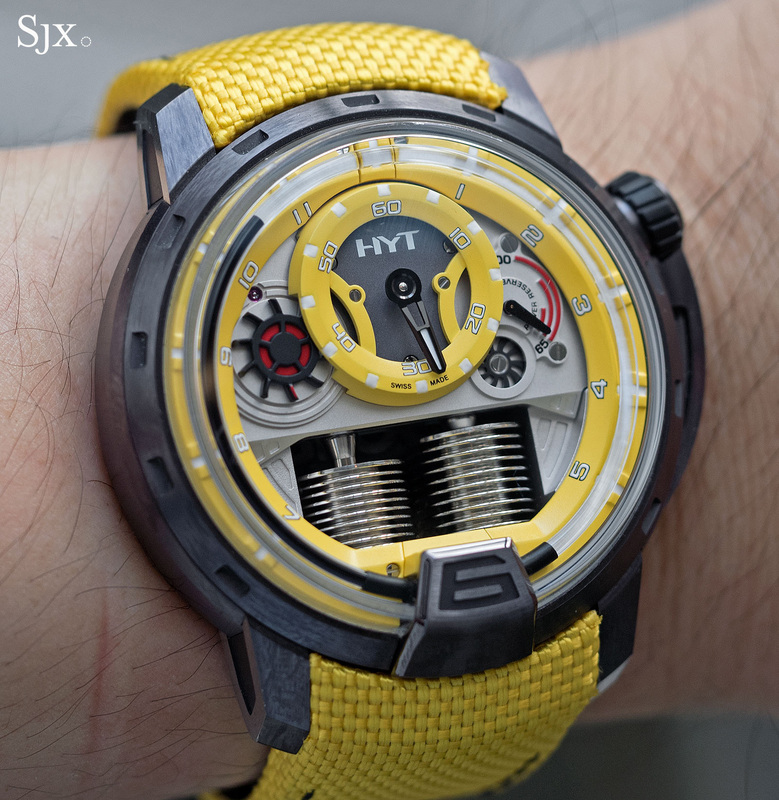 It’s a variant of the brand’s first wristwatch and now the entry-level piece in the HYT line-up, priced at SFr39,000, a third less than the next most expensive model. 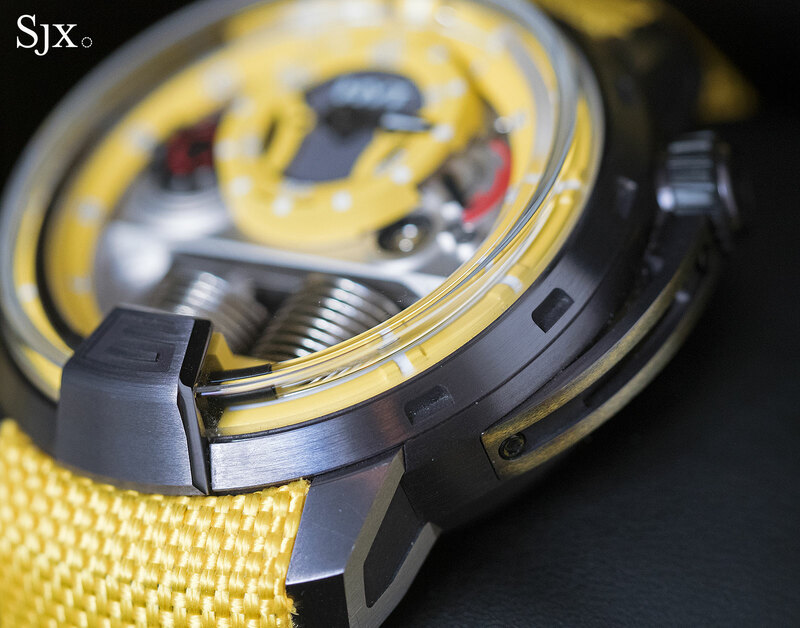 Both the chapter rings for the minutes and hours on the Colorblock have a semi-glossy, brightly coloured finish, matched by the fabric strap. 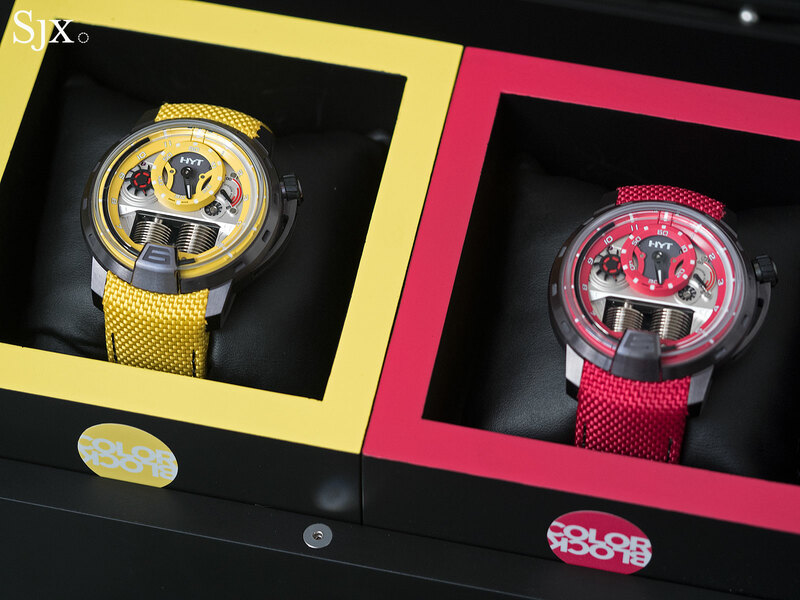 Of the three, the yellow is the most striking, the red is a muted shade, and the blue is perhaps the most restrained. 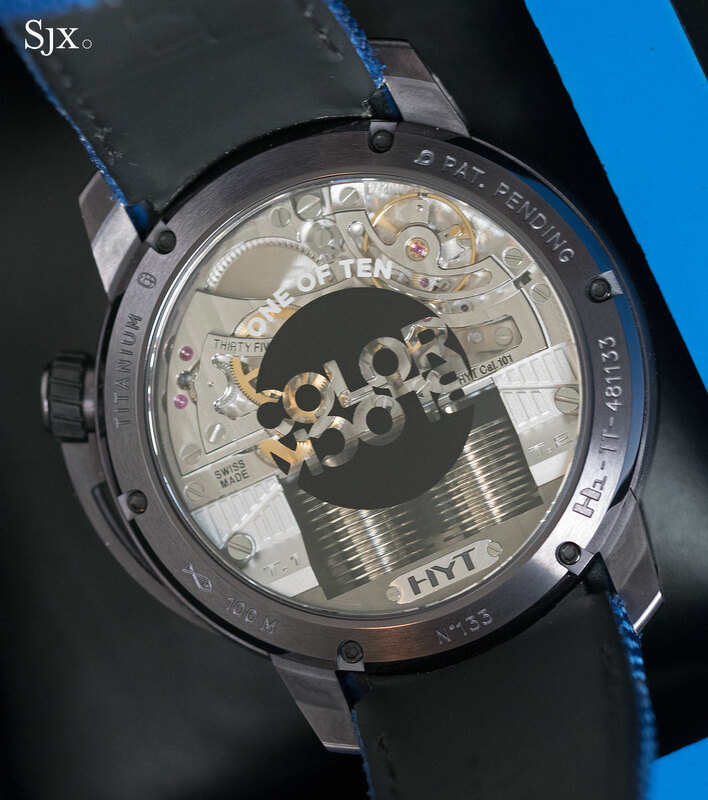 Mechanically identical to the H1, the Colorblock indicates the minutes on a sub-dial at 12 o’clock, while the hours are shown on a glass capillary filled with two liquids, one clear and the other black. The meniscus between the two liquids points to the hour, pushed along by the twin bellows visible at six o’clock. At the top of the hour, the meniscus quickly rushes back to zero like a retrograde hand, before starting over. 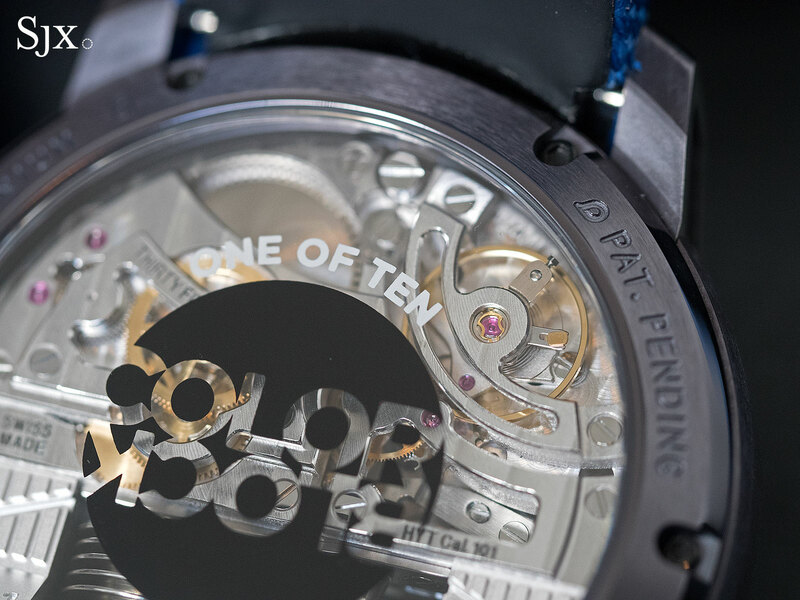 For nighttime legibility, the glass capillary is coated with luminescent Super-Luminova on its underside, which gives it a green glow in the dark. 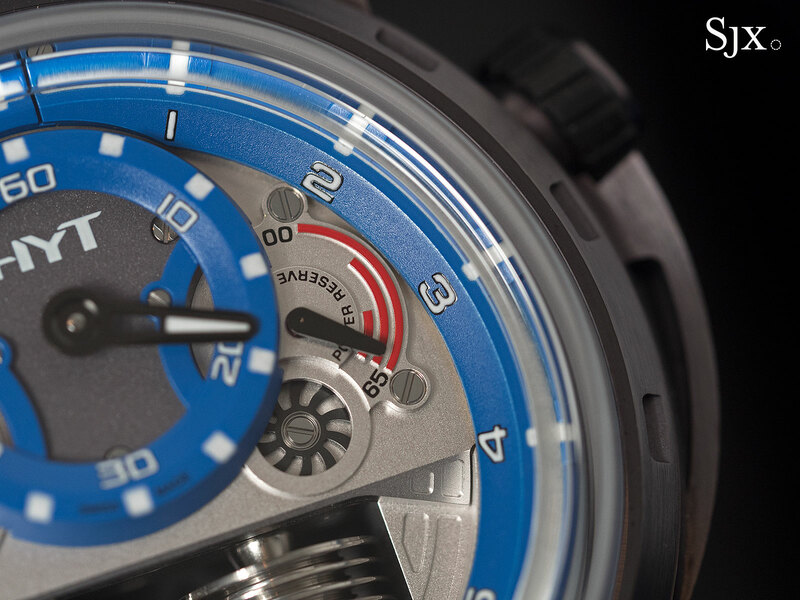 Because the black liquid inside is opaque, the hours are clearly visible against the glow. 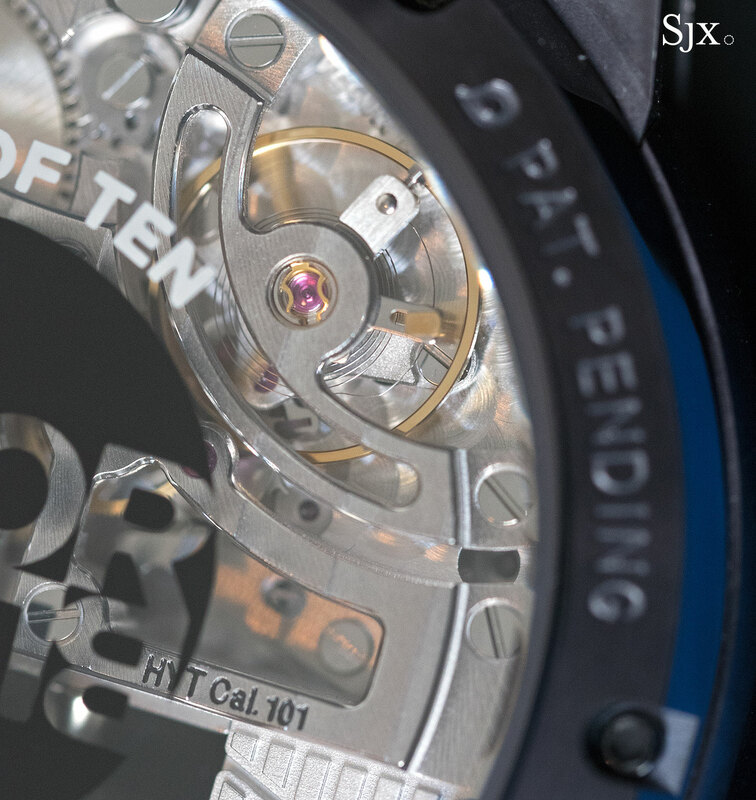 Seconds are indicated by the fan-shaped wheel at nine o’clock, while the scale at three o’clock is for the power reserve indicator. 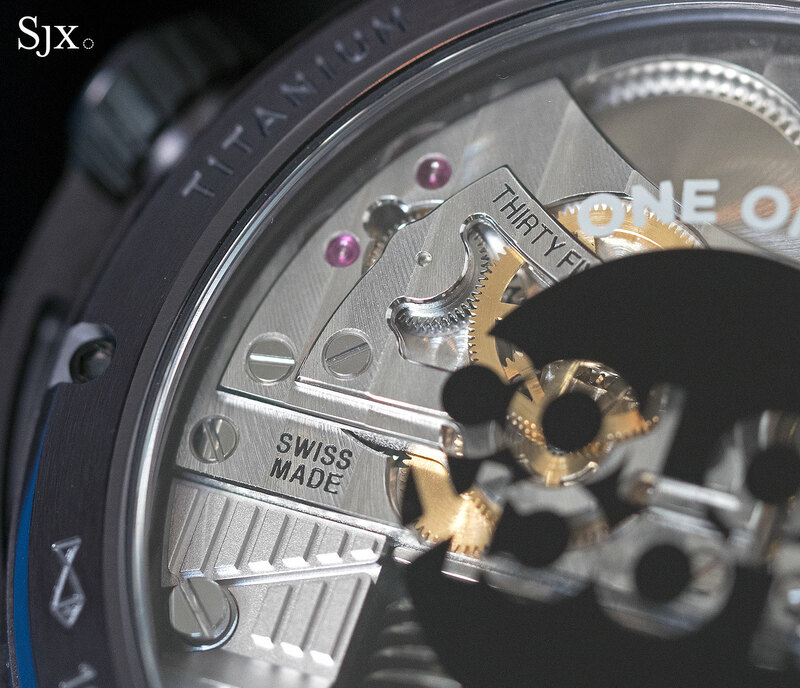 Occupying the upper half of the hand-wound movement, the timekeeping portion was developed by Chronode, a complications constructor run by Jean-Francois Mojon, well known for movements made for the likes of MB&F. 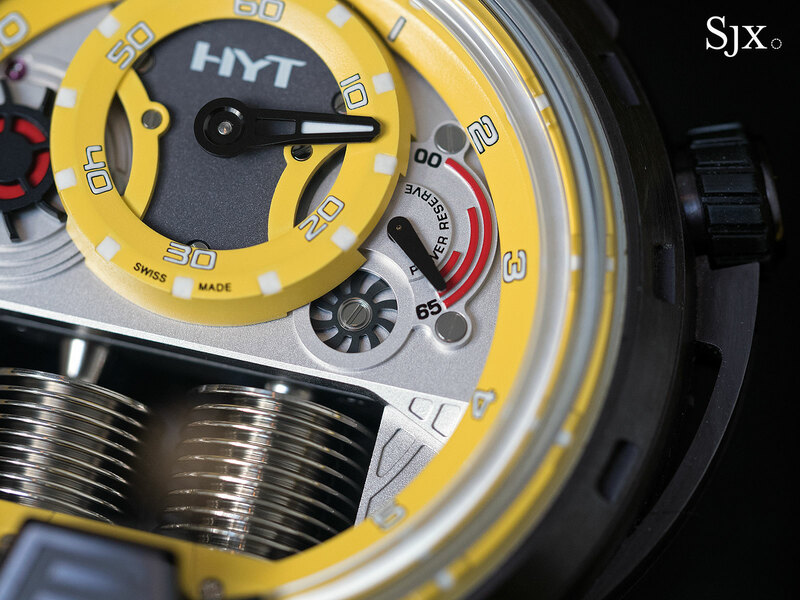 But the bellows-driven, liquid time display was the work of Preciflex, the sister company of HYT that specialises in fluid delivery via tiny tubes. 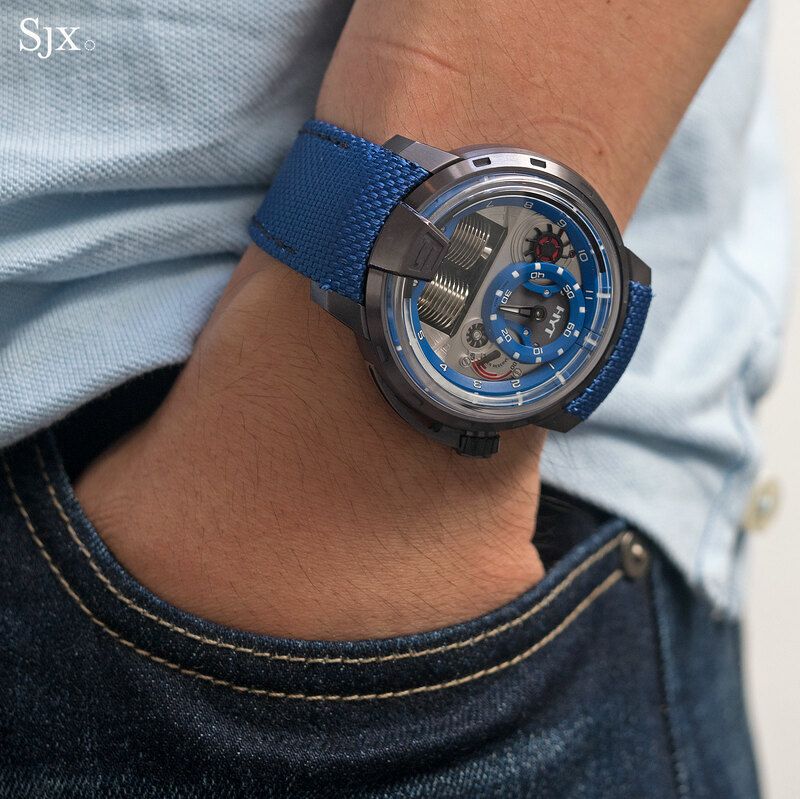 The case is titanium with a gunmetal (bluish-grey) coating and a brushed finished. 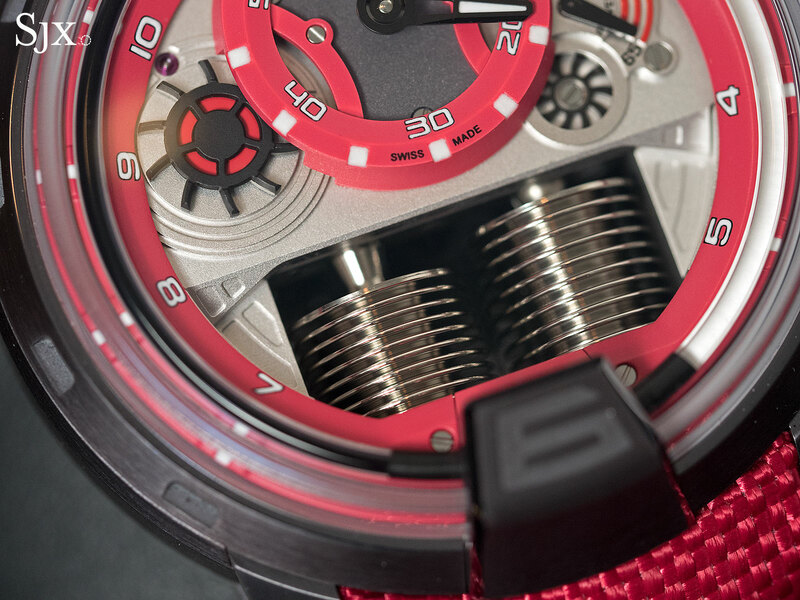 It’s 48.8mm in diameter and 17.9mm high, making it a visibly large watch, though the short, downward curved lugs help it sit on the wrist. 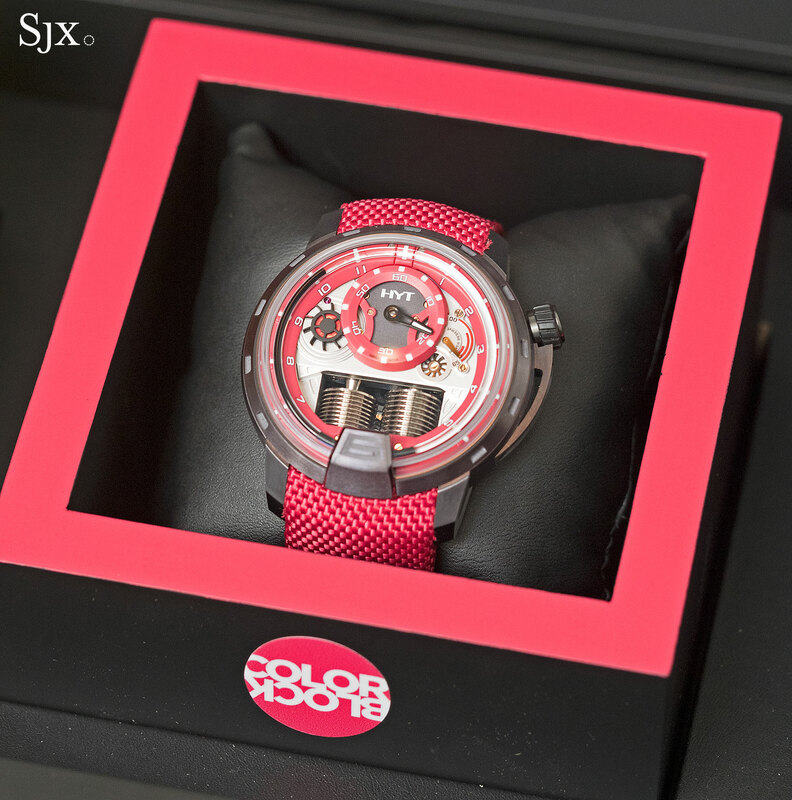 Each H1 Colorblock is limited to 10 pieces. 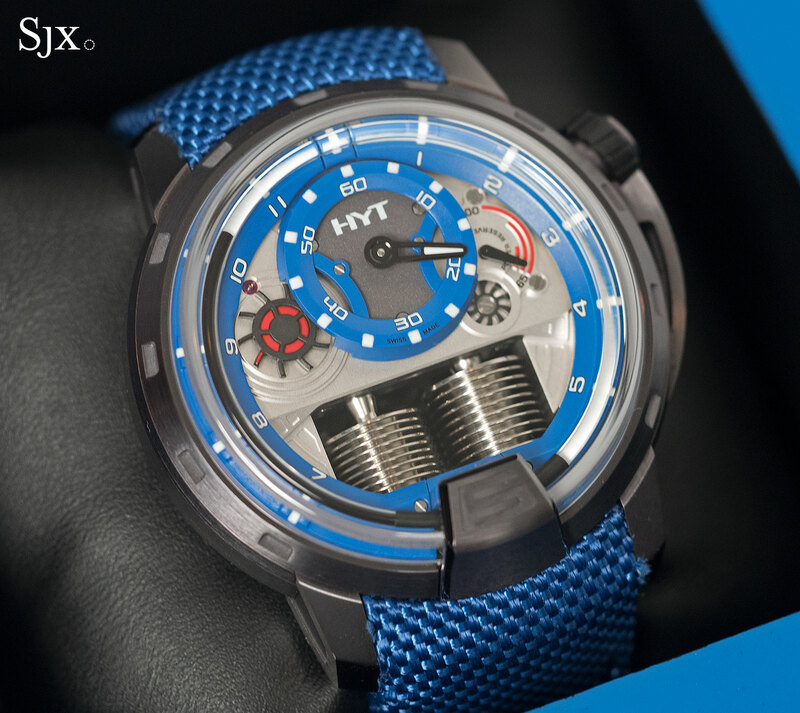 The H1 Colorblock will be available from HYT retailers starting October 2016, priced at SFr39,000 or S$55,000, both equivalent to about US$40,000.